Some Breckenridge residents are up in arms about a town proposal that would require 30-foot firebreaks around homes, but officials say the changes are needed to protect against a catastrophic wildfire. Representatives of the Breckenridge and the Red, White and Blue Fire Protection District say they intend to work with property owners regarding the proposed ordinance that town council is expected to consider within a month. “I want to make it clear: People do not need to clear-cut their lots,” town planner Jenn Cram said, adding that there will be some flexibility with property owners for preserving trees and other vegetation. But Greg Pohle, president of the Golf Course at Highlands Homeowner’s Association, argued that no live trees should be cut. 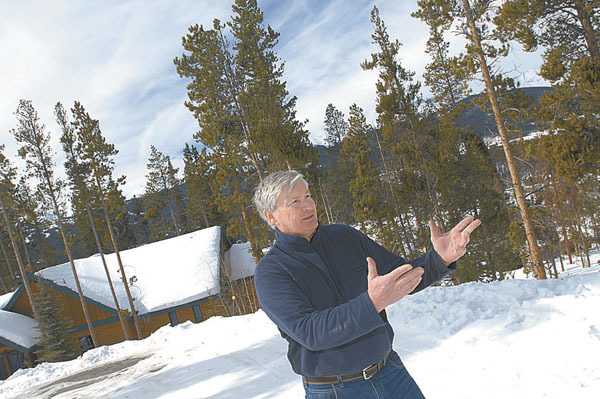 The town’s current requirements to remove lodgepole pines dying from beetle infestation should be sufficient, he said. “If my house burns because of a forest fire, I took that risk by living in the mountains,” Pohle said, adding that the town doesn’t seem to be keeping up with the beetle problem on nearby open-space land. Town spokeswoman Kim DiLallo countered that the estimated five acres of fire breaks the town and fire district have created ” with the help of Highlands subdivision and a federally-funded “wildland-urban interface” grant ” is the first of many town efforts. The Red, White and Blue fire district has a 10-year plan for creating fuel breaks, said Capt. Kim Scott. A member of the Lincoln Park Highlands Homeowner’s Association, who requested anonymity, said the 30-foot break could mean less privacy. For example, neighbors whose homes are less than 60 feet apart won’t be allowed to have any trees for screening between them. Scott responded that in such a case, there certainly would be flexibility. For example, continuous lines of 30 to 40 trees could be broken down into clumps of five or six to prevent the spread of wildfire, she said. The ordinance represents a paradigm shift, as the town braces for a big wildfire. “Unfortunately, I think where some of the heartache has been is that planning in (the) past has required all this landscaping,” Scott said, adding that people will not be asked to remove all of it. The town’s landscaping and pine-beetle ordinances are both to be revised to coincide with the defensible-space ordinance. Scott said prevention measures such as pruning trees six feet up their trunks will help avoid fire from spreading to the crowns ” where fire spreads more quickly. The inspections, which take about an hour per home, would deal with the residences case-by-case. “If people want to save a really nice tree in front of their house, we’ll go 30 feet out from there,” Scott said. Gary Gallagher, president of the Highlands Park Homeowner’s Association, said he and his organization are comfortable with the ordinance in its current form. He said some push-back against the requirement that homeowners pay to remove trees is understandable, considering the economy. However, the move is worth preventing a firefighter from injury, for example. So long as the inspectors indeed deal with the properties individually, it should be OK, he said. “It’s going to be more of an art than it is a science,” Gallagher said. Homeowners should follow the town’s recommendations, he said, because insurance companies could use the ordinance to deny coverage to those who don’t comply, he said. State Farm Insurance claims section manager Trina Markey said her company inspects homes and will in some cases ask the owners to comply with defensible-space recommendations to avoid increased deductibles or other action. But property owners are notified and given year to comply, she said. “If we have not taken underwriting action and notified (the property owner), there is full coverage on that policy, regardless of whether defensible space was there or not,” Markey said. But Pohle said one of his HOA members already has taken heat from a different company after it learned that the fire district was seeking fire-mitigation funding. Breckenridge Councilman Peter Joyce said he is confident in the town’s cooperation with the fire district to brace against a massive fire. His concern regarding view corridors being affected by clear-cutting has been alleviated. “My read is that they’re going to go after this carefully and selectively, lot by lot,” he said. Gallagher said that while the situation isn’t perfect, the mitigation measures are necessary. The Lincoln Park HOA member who was concerned about the 30-foot fire breaks already has taken some action, despite concerns, to protect the home. When the town was considering a 15-foot fire break last fall, the resident proactively had the property inspected and was advised ” and bought a permit ” to cut down every evergreen in that radius. “I’d just as soon not see my house burn down,” the homeowner said, adding that taking another 15 more feet of trees could be equivalent to clear-cutting. Scott said the break was extended to 30 feet because it would provide more flexibility. For more information regarding the fire district’s plans for Breckenridge neighborhoods, contact Scott at (970) 453-2474 or kscott@rwbfire.org.